This time of year, people often remember that its a season of gifting but also a season of giving. Socks are such an inexpensive but fundamental need across the world, and the donation of socks is so simple yet so meaningful to those in need. Here are 3 subscription services that have a charity component to their sock of the month club. For every subscription purchased on Sock Panda, the company donates a pair of socks to those in need. According to their site, as of September 2017 this amounts to almost 100,000 socks that have been donated. We haven’t written about Bombas much on Sock Clubs, but its always worth noting sites that make an extra effort to contribute to charity. At Bombas, they have engineered a specific sock designed for people who don’t have the luxury of buying enough socks to put on a fresh pair every day — including anti-microbial treatment that requires less washing. Every sock pair purchased is a sock pair donated by Bombas. Sockwork is unique because they contribute a portion of their profits to a new veteran charity each month. 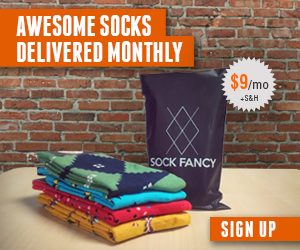 Sockwork is powered by Cratejoy’s subscription eCommerce software, and is a great way to get custom socks delivered to your door each month and feel good about also making a charitable contribution. Previous Article Cyber Week sale at Say it with a Sock! Next Article Foot Cardigan vs. Say it with a Sock: the best sock of the month club?